Introduction EMSL Analytical, Inc. has opened a new mold testing laboratory in Tampa, which marks the company’s fourth facility in the state of Florida. EMSL Analytical, Inc. has opened a new mold testing laboratory in Tampa, which marks the company’s fourth facility in the state of Florida. EMSL’s Tampa laboratory offers quality analysis and customer service for mold testing services. 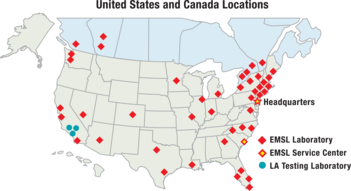 EMSL has now expanded to 42 testing laboratories throughout the United States and Canada. People concerned about the possible presence of mold in their home, school or work environment are encouraged to have the property inspected and tested for the presence of elevated levels of mold. EMSL Tampa offers mold testing, sampling supplies and easy-to-use test kits. These services can help to identify a mold issue so that corrective actions can be implemented to stop the moisture problem and have the mold contamination removed from the environment. EMSL also offers water damage testing field instrumentation that can be essential in finding the source of any moisture. The laboratory is located at 5700 Memorial Highway, Suite 110, in Tampa, Florida. The laboratory can be reached by calling (813) 280-8752. For more information about EMSL’s laboratory services and products, please visit www.EMSL.com or call 1-866-798-1089 or email info@emsl.com.